Natural moss is often my inspiration when creating floral arrangements and crafts. It is so incredibly soft and magical in its natural setting. Honestly, a feeling of guilt comes over me when I harvest this green gold. Yes, you can buy it in bags from various sources but it’s never quite the same as a freshly picked batch. In an effort to recreate nature’s wonder and to tread lightly on Mother Nature, I whipped up these felted wool moss-inspired place card holders. With the exception of the dish-washing detergent, you can find all of the craft ingredients at any craft store. Select the approximate size of the moss cap you want to create by pulling the felt apart. Form it into a ball or oval and add one drop of dish washing liquid onto the felt. Then, while running it under warm water, roll the felt into the shape desired. The dish washing liquid helps form the shape when it dries. Be careful not to add too much soap. Form the wet felt over a rock and let dry overnight. When the felt is dry, remove it from the rock, place glue under the felt and glue it to the rock. Let dry completely. 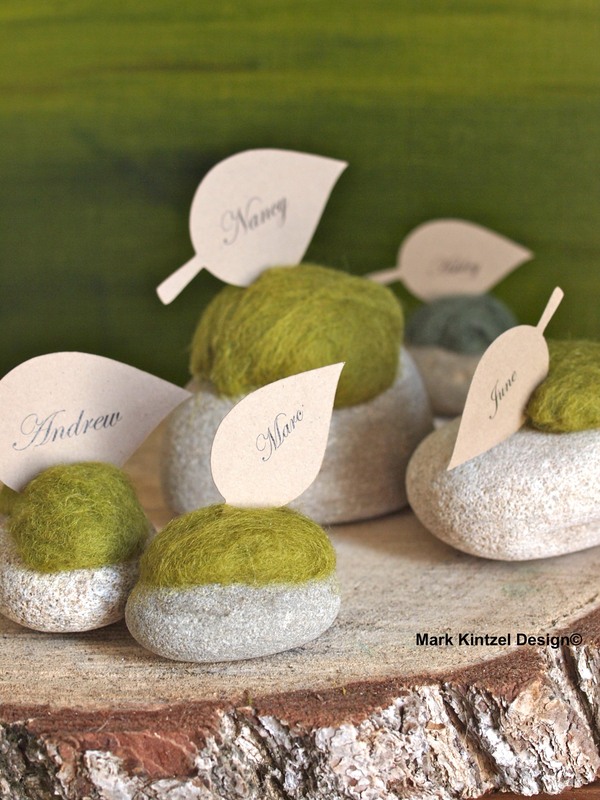 Using a razor blade, create an incision on the top of the felt moss and insert a place card. Here’s to adding magic to your next event or wedding…happy crafting! Watch my YouTube videos here.